The Empowerment of the Venus Contest (meet Andrea). VT16 STARTS TODAY! You are here: Home / Contest / The Empowerment of the Venus Contest (meet Andrea). VT16 STARTS TODAY! The Venus Contest VT16 starts TODAY! What better way to start a contest than with a story of our beautiful Venus Andrea who DID NOT THINK SHE WOULD PLACE in the contest and did! She did place in the contest! See that’s what happens. Your mind doesn’t always “get” your progress. That’s when a coach helps and Andrea gets to tell the story about how Venus coaching helped her. My experience with Venus has been amazing. 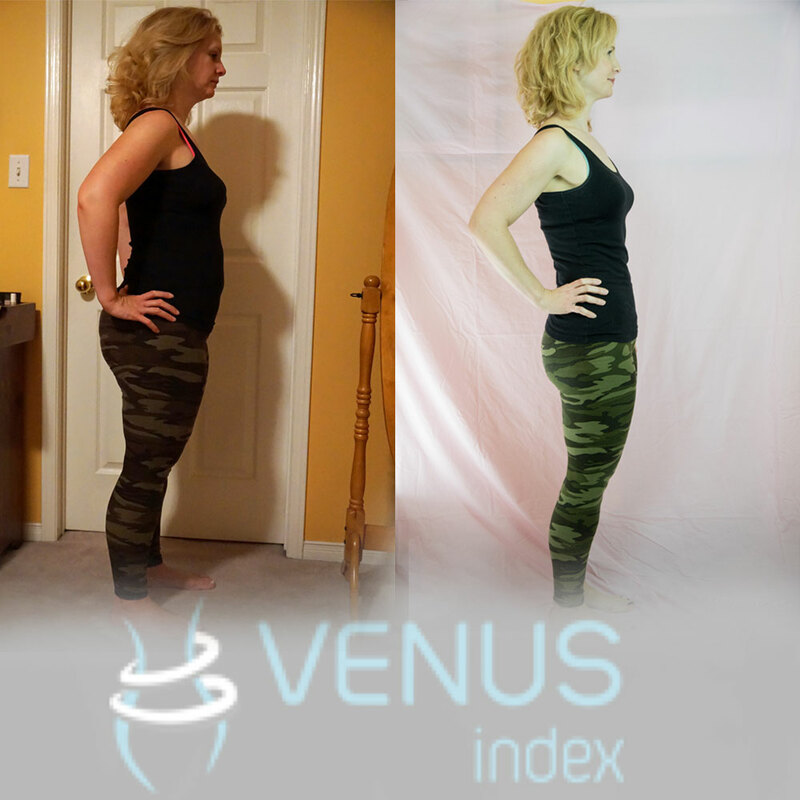 From the nutrition and fat loss information, to the workouts, to the fabulous community of supportive and genuine women, Venus has been the answer I’ve been looking for to finally achieving my fitness goals. I don’t really feel as though the contest signifies the end of a “diet” for me – since tomorrow, and the next day, and the day after that, I’ll still be eating the same way. It’s become such a habit for me to look at food and eating in this way, I can’t imagine doing anything differently just because the contest has ended. I’ve really come to appreciate that when I say “yes” to something (dessert, snacks, sugar, empty calories), I’m also saying “no” to something else (feeling confident about how I look, easily pulling on a pair of pants). That makes it a lot easier to feel good about choosing not to indulge, rather than feeling deprived – it’s a conscious choice, not a sacrifice. And I’ve come to realize just how much the mental toll of poor eating choices was really weighing me down. Total avoidance was my only strategy, and sometimes that just wasn’t possible. So I’d indulge, then feel guilty the minute I did, because I knew that choice was working against my goals. It was a vicious cycle that I had no idea how to break. But Venus helped me to do just that. I was completely amazed at how often that guilt was there in the back of my mind, which I only really realized when all of a sudden, it wasn’t anymore. By learning how to plan for bigger events and using tools to “save the day” for those times when temptation got the better of my well-laid plans, I discovered how to not feel guilty about what I’m eating. That is a huge shift for me, and a huge relief. One of my biggest complaints with the fitness industry as a whole is the emphasis on exercise and working out as the key to losing weight. I’ve had a gym membership for my whole adult life, and not until I learned more about the importance of food choices did I start to see a change in my physique. Not that exercise isn’t important, but Venus has really helped me to understand that it’s just not possible to out-train a bad diet. And now that I’ve lost some of the extra fat I was carrying, I’m excited to continue the Venus workouts and develop some of those muscles! After trying more dieting approaches than I care to count, I’m excited that I’ve found a plan that works and that I can be successful at for the long term – while still living (and enjoying!) my life. It’s easy to join. Any Venus customer can join at any time. You can enter both your before and after pictures any time between January 11th and April 11th, but you will want to TAKE your before pictures as soon as you can after the 11th (with the current newspaper). Once you get your pictures and measurements simply go to the contest form and enter them. Email me roberta.saum@gmail.com if you have any questions or need any help. PS: If you want Venus one-on-one coaching you can get it here. Yes, you are allowed to pick which coach you want! Andrea did a fabulous job! To listen to her story about how she became EMPOWERED by Venus and Venus coaching.